Sleep in Old Louisville during the Holidays! Christmas and the holidays are always a special time of year in Old Louisville. The great houses wear their holiday cloaks and many a parlor in these fine old homes are transformed into romantic dreams of Christmas past. 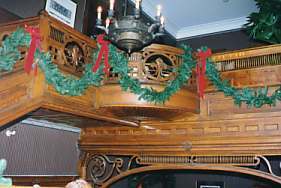 You can experience some of this magic in Old Louisville's Victorian Yuletide Holiday House Tour, which takes place every year on the first weekend in December. The 2006 tour will be held on Saturday December 3, and Sunday December 4, from noon until 6pm. Old Louisville's finest mansions will be decked in holiday splendor. What makes this all so special is that most of these houses are private homes, and are rarely ever open to the public for tours. In fact, most individual houses are open to the public only once in a lifetime. So if you missed a house this year, you may not get a chance to see it ever again. And you may return year after year, and the tour will never be quite the same! We've heard many who came away from the tour exclaim that the tour seemed more like Christmas than Christmas itself. We who live here sometimes forget that not everyone routinely has the opportunity to experience our magnificent Victorian interiors, much less with giant Christmas trees, hearths and doorways and staircases festooned with garlands. It truly can be an old-fashioned picture-postcard Yuletide dream. The proud owners of the houses go all out in their decorating. Visitors enjoy the scent of cedar and pine and spice. Visitors also get to meet some of the people who live in Old Louisville. Each house is manned by volunteers from the neighborhood, and sometimes the owners themselves, who will explain some of the unique architectural features of each home, and sometimes an unexpectedly fascinating history. Visitors can see for themselves how Victorian ambiance is blended into our modern lifestyle. The tour is sponsored by the Old Louisville Neighborhood Council. Tickets are only $20 per person if purchased in advance or $25 on the days of the tour. There will be a holiday gift boutique. Transportation is provided between the houses, and several Old Louisville restaurants will be open during the tour so that you can experience a taste of Old Louisville as well! You can get tickets from the Old Louisville Information Center, or order on line. The center is located in Central Park just across from the intersection of St. James Court and Magnolia. The telephone number is (502) 635-5244, and the center is open weekdays from 1pm until 5 pm. Mailing address is 1340 S. Fourth Street in Central Park, Louisville 40208. On the days of the tour, the ticket booth will be in the Conrad-Caldwell House. Use the Magnolia Street entrance. Click here for more information and advance ticket order form for this year's Mansion Tour. Trying to think of a great holiday gift? How about sending someone special some of the best bourbon candy on the planet from the Old Louisville Candy Company. It's a mom and pop source that makes bourbon balls by hand in a mansion on Third Street: Click here for more. Another Old Louisville holiday tradition is the Living Christmas Tree at the Walnut Street Baptist Church at Third and St. Catherine. There will be several performances of this annual event. It's a beautiful sight with beautiful sounds in a beautiful setting. Although tickets are free, seating is limited compared with the great demand, so it's best to get your tickets early (order on the Walnut Street Baptist web site). There may be no information there until late, so you might contact the church for ticket information, phone (502) 589-5290, or email.